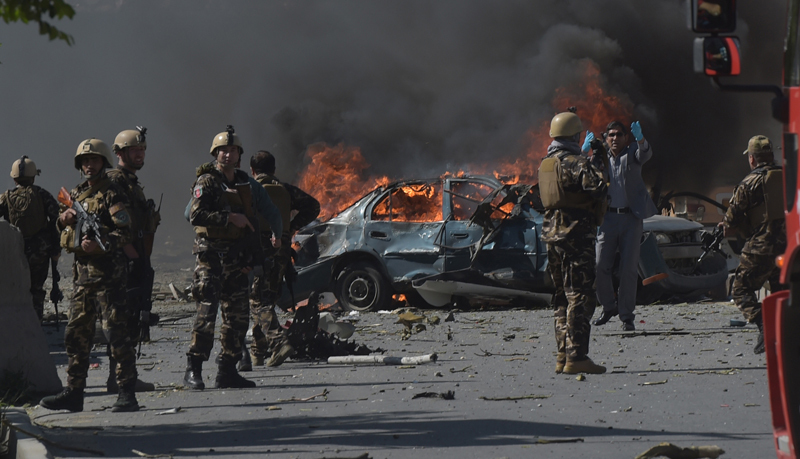 Afghan Security Forces personnel at the site of a car bomb attack in Kabul. The Institute of National Security Studies Sri Lanka will jointly conduct South Asia Regional Seminar “Dealing with the missile threat in South Asia” with Foundation for Strategic Research, France and European Union External Action Service on January 15, 2019. This explainer on ballistic missile proliferation explains a few key aspects of the Hague Code of Conduct against Ballistic Missile Proliferation (HCOC) in relation to small states with special reference to Sri Lanka. Ballistic missiles are rocket-propelled weapons systems capable of carrying high explosives and also chemical, biological and nuclear munitions. Ballistic missiles fall into several categories such as strategic missiles (capable of being launched by land or sea), submarine-based fleet ballistic missiles, and intercontinental ballistic missiles etc. Currently, there are several states that have developed nuclear weapons: United States, Russia, United Kingdom, China, France, India, North Korea, Israel, and Pakistan. The ballistic arms race could be traced back to the Cold War period between the former Soviet Union and the USA. Most other countries have not developed missile capability to the extent of these two States. However, the technology of manufacturing these weapons have transferred to less developed countries. Ballistic missiles with chemical warheads are now a danger to third world countries. Hence the Hague Code of Conduct becomes an important instrument to create transparency on issues pertaining to ballistic missile proliferation. The Hague Code of Conduct against Ballistic Missile Proliferation (HCOC) was established in 2002 to create politically binding commitments on the conduct of trade in missiles. The commitments encompass pre-launch notification of missiles and test flights, annual declarations of country’s policies on ballistic missiles launched during the preceding year, number and generic class of ballistic missiles and space launch vehicles etc. As of today, there are 139 signatories to the HCOC. The development of ballistic missiles began during the Second World War but the first agreement (even at interim level) occurred in the 1960s with the Strategic Arms Limitations Talks (SALT) on limiting the development of inter-continental ballistic missiles, submarine-launched ballistic missiles (SLBM) and modern ballistic missile submarines. This was amidst the backdrop of the Cold War. Independent of multilateral agreements, bilateral agreements occurred between Russia and USA [referring to Anti-ballistic Missile treaty 1972]. However, the proliferation was serious with countries outside Soviet and US allies gaining access to missile development technology and increasing military capabilities due to threat perceptions of adversary states. This was the case with India and Pakistan; neither country is reluctant to enter legal commitments on nuclear weapons including ballistics. The code is also manifestly different from a legal agreement since violation of this could only result in political repercussions. The code is practical in the sense it includes a wide range of commitments such as compliance to international arms control, disarmament and non-proliferation norms in broad language. The Code is voluntary and open to all states since countries are reluctant to enter legally binding agreements. It seeks to promote security through political and diplomatic measures. If this agreement was legal in character such as the Arms Trade Treaty, countries would be less reluctant to sign it; this was the case with both India and Sri Lanka rejecting the treaty as containing intrusive provisions. The code expects states to implement voluntary basis access of ballistic test launch sites to international observers. Countries are not forced to comply with these requirements but to rather “consider” the implementation. This is both clever but the effectiveness of the Code on actual non-proliferation of ballistic missiles is yet to be seen. Sri Lanka, as a small state, has traditionally maintained an anti-proliferation stance. One main reason as to why this policy is prudent is because continued proliferation between nuclear-armed regional heavyweights India and Pakistan have increased regional tensions. There has been a long-standing conventional military imbalance favouring India. Consequently, a study by Kapur found that nuclear proliferation encouraged increased Pakistani aggression over Kashmir due to the stability-instability paradox. The stability-instability paradox is where mutual deterrence and the threat of nuclear war create a window for states to pursue their actions through coercion. Being a founding member of the Non-Alignment movement, Sri Lanka has historically looked to stay away from and minimize rivalries between larger countries. Thus, it makes sense for a small regional country like Sri Lanka, whose interest lies in maintaining stability and dialogue in the region, to be one of the original sponsors of the Hague Code of Conduct in 2004. Moreover, in addition to promoting an atmosphere of regional cooperation, Sri Lanka has interests in maintaining good relations with both nations. Finally, small states like Sri Lanka are against ballistic proliferation due to the devastating possibility that such delivery systems together with nuclear material will fall into the hands of non-state actors and terrorist groups. There are numerous Jihadist groups operating across the porous borders of Afghanistan and Pakistan who have carried out a number of major attacks, including the Mumbai terror attacks of 2010. Sri Lanka itself has no active terrorist groups operating, but has experienced a civil war of over thirty years and therefore understands the threats these groups can pose. This leads to increased resolve against non-proliferation. Small countries lack the economic and military prowess of larger countries, which gives them less bargaining power. This makes them more reliant and supportive of multilateral institutions in order to achieve objectives like non-proliferation.